"Munich is a village." It's a saying you hear often, and that the city is so manageable that you can explore a lot of the sights on foot. Is that true? We decided to find out, and on a sunny summer's day we walked from east to west. We walked from the Prinzregentenplatz in Bogenhausen to the Nymphenburg Palace – a wonderful day trip packed with nature and culture, and the realisation that you get to know a place in a completely different and more intensive way when you're not sat in a car or on a bus. You discover the details and things you hadn't set out to find. But you need to be sure-footed. But don't worry – if you want to take it a bit easier, we have broken the approximately 12 kilometre route down into stages that you can walk separately. Which leaves you more time to devote to the sights along the way. We start at the columned portico at the entrance to the Prinzregententheater – named after Prince Regent Luitpold and built between 1900 and 1901 in the style of the Richard Wagner Festival Theatre in Bayreuth. The theatre building on the Prinzregentenplatz impresses with its very special combination of elements from art nouveau and classicism. 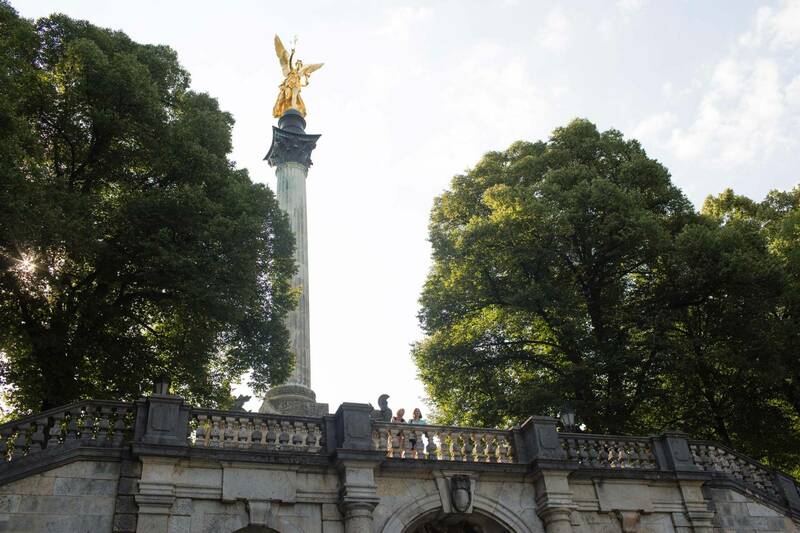 We continue along the Prinzregentenstrasse, past the Prinzregentenbad swimming pool and the Villa Stuck, to the "Angel of Peace", as the people of Munich call the monument high on the banks of the Isar. Inaugurated in 1899, it is designed as a reminder of the peace agreement following the Franco-German war of 1870 to 1871. What many people don't know: The angel is not an angel in the Christian sense, but represents Nike, the Greek Goddess of Victory – and so is also a reference to the Germany troops' victory against the French. What many people don't know: The angel is not an angel in the Christian sense, but represents Nike, the Greek Goddess of Victory – and so is also a reference to the Germany troops' victory against the French. 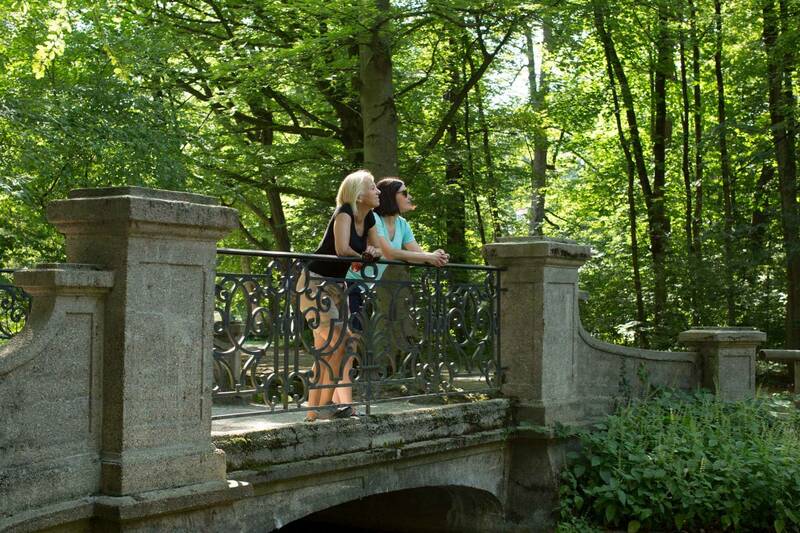 The route to the Bogenhausen Cemetery takes you along the park-like Maximilian gardens on the banks above the Isar. On the Maria-Theresia-Strasse – one of Munich's noblest areas – you will see impressive, sometimes palace-like art nouveau villas. 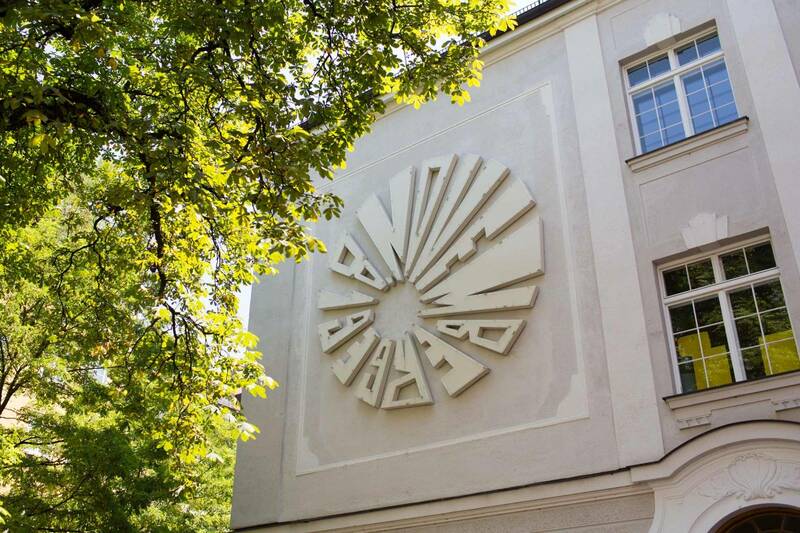 Book-lovers should stop at the Monacensia, the city of Munich's literary archive in the former artist villa of the sculptor Adolf von Hildebrand (1847 to 1921). The Bogenhausener Kirchplatz at the end of the street has the feel of a Bavarian village. 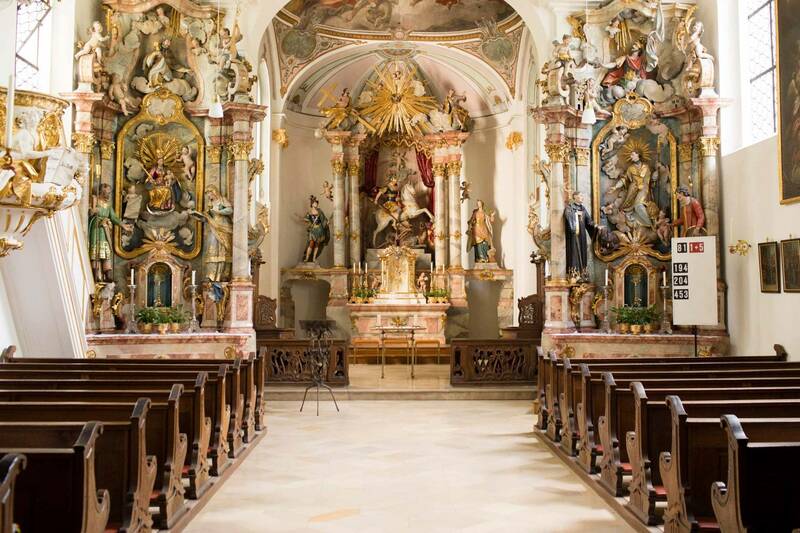 The cemetery, with its late-baroque church of St. Georg, is the embodiment of what is generally defined as a gem. 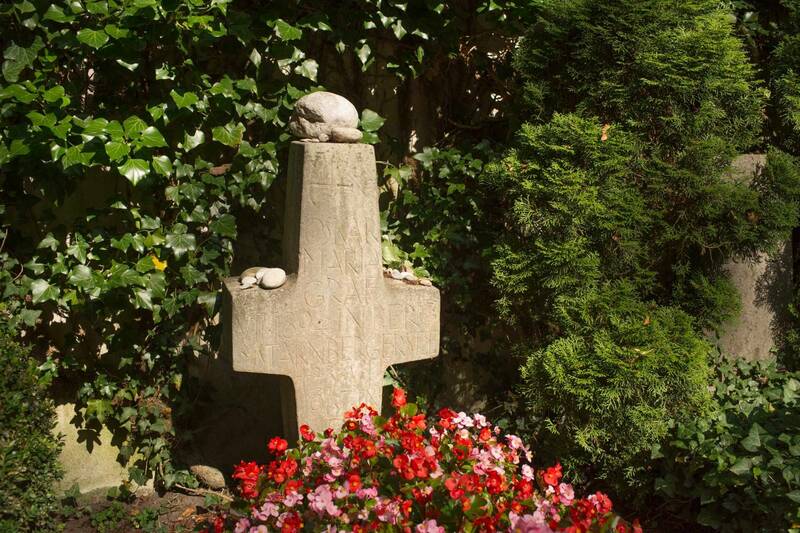 Here, you will find the graves of Munich personalities such as Liesl Karlstadt, Erich Kästner, Rainer Werner Fassbinder and Oskar Maria Graf. On the Max-Joseph Bridge, we enjoy the view over the Isar, where an angler is trying his luck on the wide gravel bank. 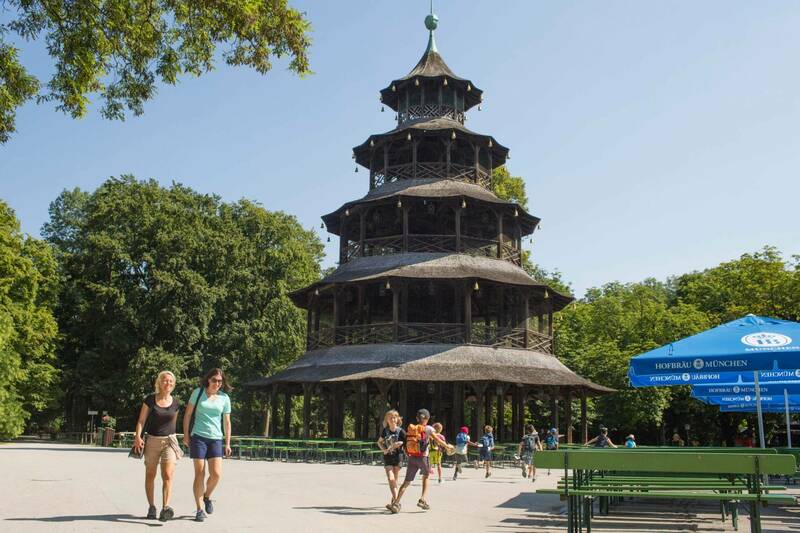 We walk along the Tivolistrasse towards the Chinese Tower in the Englischer Garten. 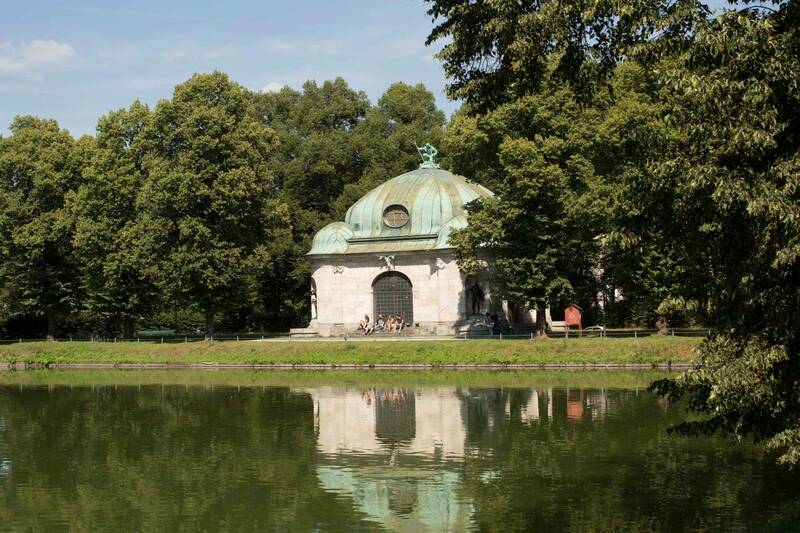 The Englischer Garten, today one of the biggest parks in the world, was given to the people of Munich by their, actually unpopular, Palatine Elector Karl Theodor. 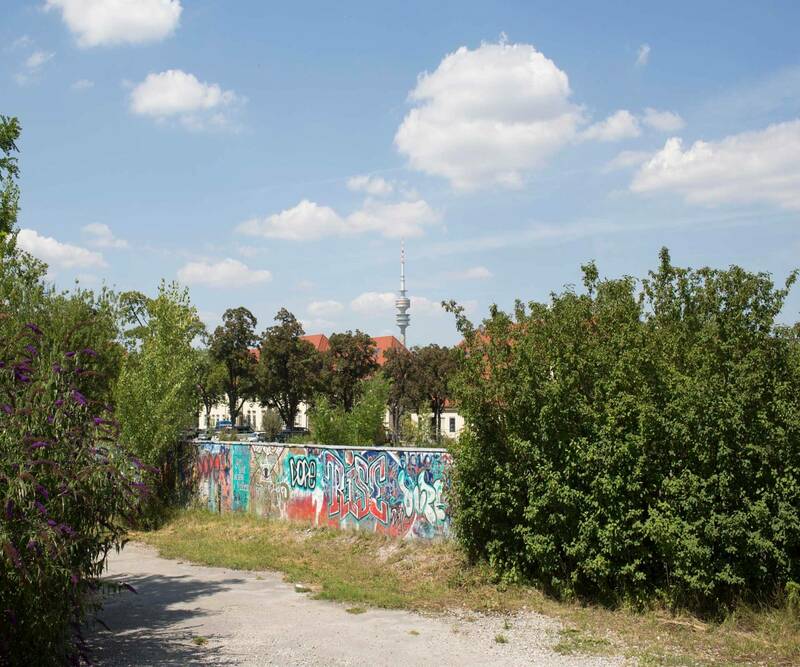 The idea behind it - to give ordinary people leisure opportunities - initially seemed strange to Munich's residents. There, we pause for a rest on one of the benches in the beer garden and reflect on how the history of the Englischer Garten began in the 18th century: The park, today one of the biggest in the world, was given to the people of Munich by their, actually unpopular, Palatine Elector Karl Theodor. The landscape architect Friedrich Ludwig von Sckell was responsible for the design. The idea behind it - to give ordinary people leisure opportunities - initially seemed strange to Munich's residents, and in some ways almost decadent. Only when the restaurant at the Chinese Tower opened as a destination did they come to like their new city park, which by the way was initially called Theodor's Park. The Chinese Tower was part of a Chinese village which sadly no longer exists. With building such as these, the rulers wanted to give their subjects an impression of how things looked out in the big wide world. And at that time, the tower afforded a magnificent view over the city. Although the tower is now closed to visitors, in good weather a brass band plays on one of its five floors to the delight of people in the beer garden. We stroll from the Chinese Tower heading south towards Monopteros. King Ludwig I commissioned Leo von Klenze to build the round temple in the Greek style in the first half of the 19th century. Climb to the top if you wish, as the view across the southern part of the Englischer Garten and Munich's skyline is fabulous. Now we have deserved some sustenance! 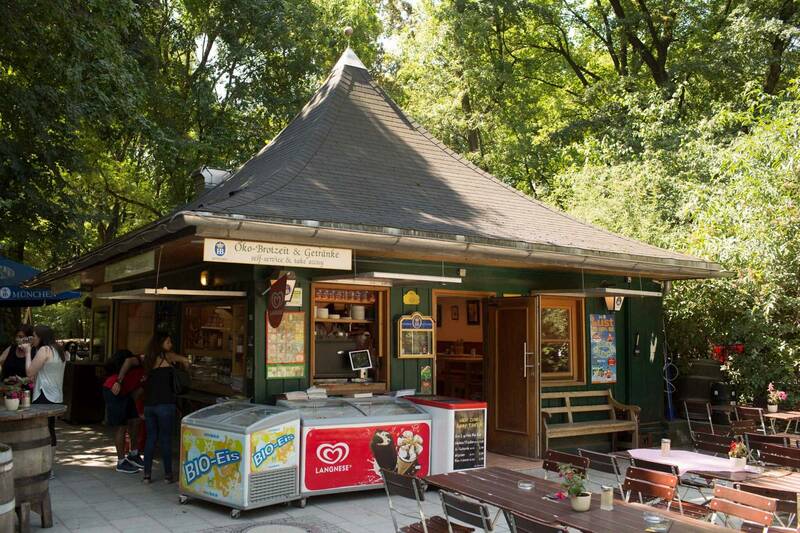 So our next stop for a late breakfast has to be the Milchhäusl snack bar at the main entrance to the Englischer Garten on the Königinstrasse. On our way there, we cross the Schwabinger Bach, on whose banks lie the first sun worshippers and children – on a school trip no doubt – play football. The clear water is too tempting. No question – we take off our shoes and socks and wade through the ice-cold steam. An incomparable delight - after the first few seconds! The name Milchhäusl, by the way, is a reminder of the period following the Second World War when the starving people of Munich were given milk and bread here. Today, organic specialities are served up in the shady beer garden or in the winter in disused, but therefore heated, ski gondolas. 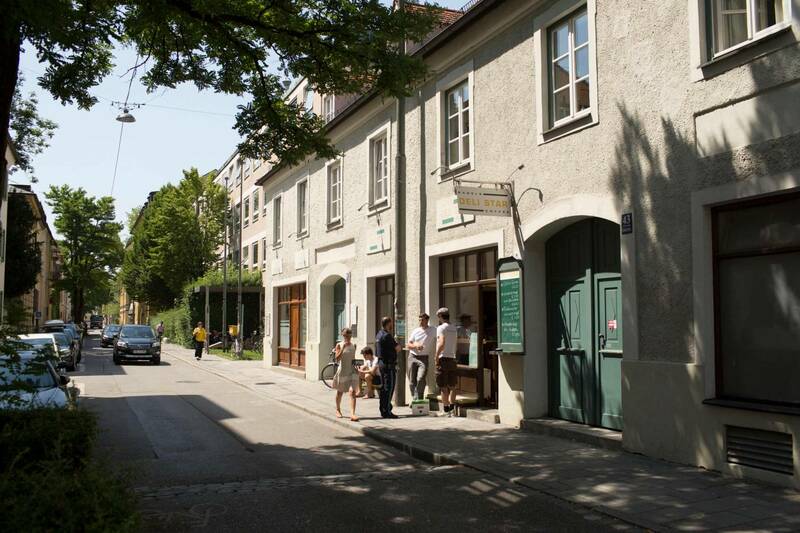 We continue along the Veterinärstrasse towards the Ludwig-Maximilians-University. We first come to the semi-circular Professor-Huber-Platz and its western counterpart, the Geschwister-Scholl-Platz, on the other side of the Ludwigstrasse. The two squares are named after members of the "White Rose" student resistant movement, which rebelled against the Nazi regime during the Second World War. In front of the main entrance to the university, flyers have been inlaid in the ground as a reminder of the group's activities. Inside the university, in the central atrium, you can also see the "White Rose Memorial". King Ludwig I moved the Ludwig-Maximilians-University from Landshut to Munich in 1826, and with some 50,000 students, it is today one of Germany's largest universities. The main building, in Rundbogenstil or round arch style, dates back to Friedrich von Gärtner. We leave the university building by the rear exit and turn left along the Amalienstrasse. 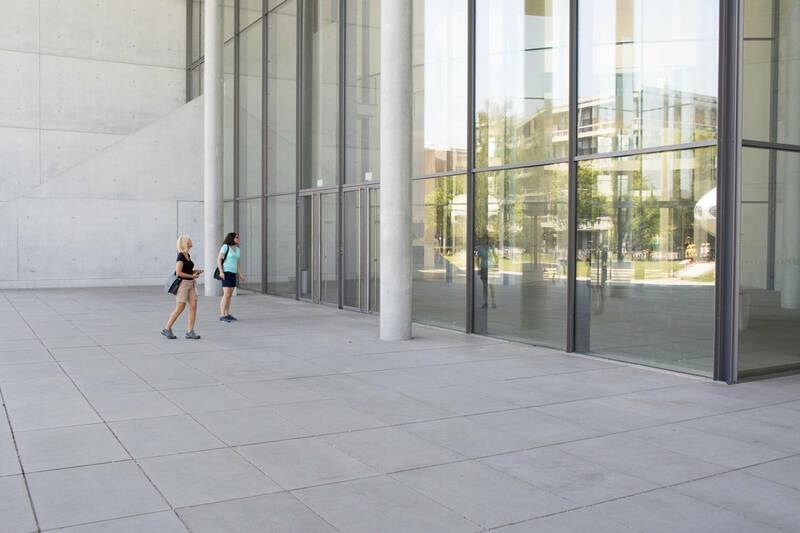 This is the place to immerse yourself in Munich student life. The street, with its many small cafés, restaurants and shops, is named after Princess Amalie Auguste of Bavaria, the daughter of Max Joseph, the first King of Bavaria. At the end of the Theresienstrasse, we turn right. 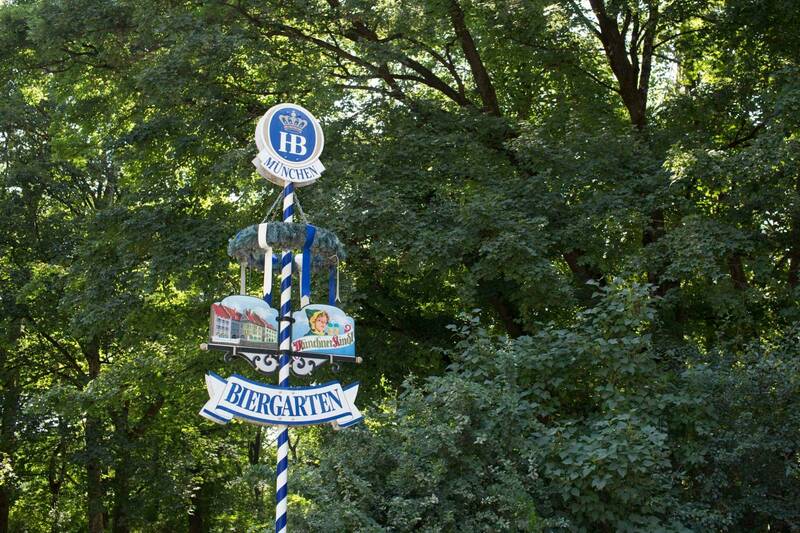 The Theresienstrasse is even named after a real queen, Therese of Bavaria, whose marriage to King Ludwig I in 1810 was celebrated with the Oktoberfest, still held today on the Theresienwiese. After around 170 metres, we come to the Museum Brandhorst, which is already part of the Kunstareal museum quarter. Be sure to take a look at the monumental rose paintings by Cy Twombly – a true spectacle of light and colour. 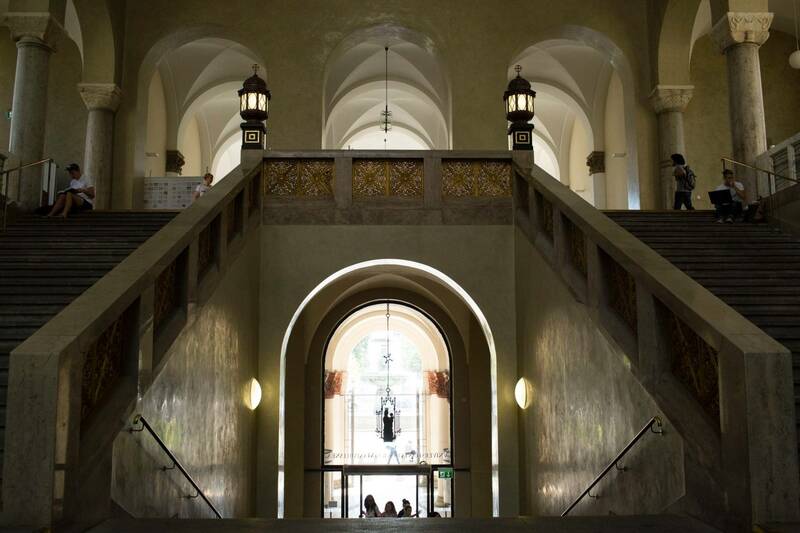 Much of what Munich has to offer culturally and architecturally is here in the Kunstareal museum quarter, including the Bavarian State Painting Collections with the Alte Pinakothek, the Neue Pinakothek and the Pinakothek der Moderne, the Egyptian Museum and the NS Documentation Centre. 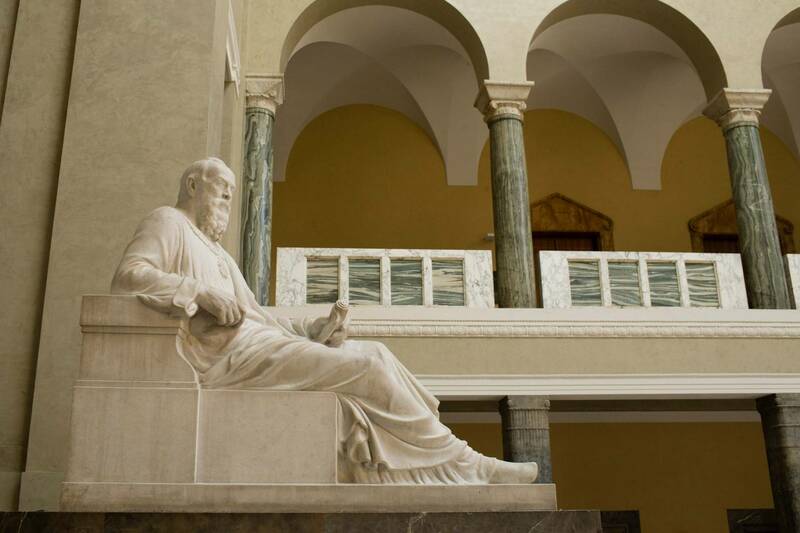 You'll feel like you're in Greece at the Königsplatz with its classicist buildings the Glyptothek, Propylaea and the Staatliche Antikensammlung collection of antiquities. In the 19th century, King Ludwig I dreamed of turning Munich into an "Isar-Athens". 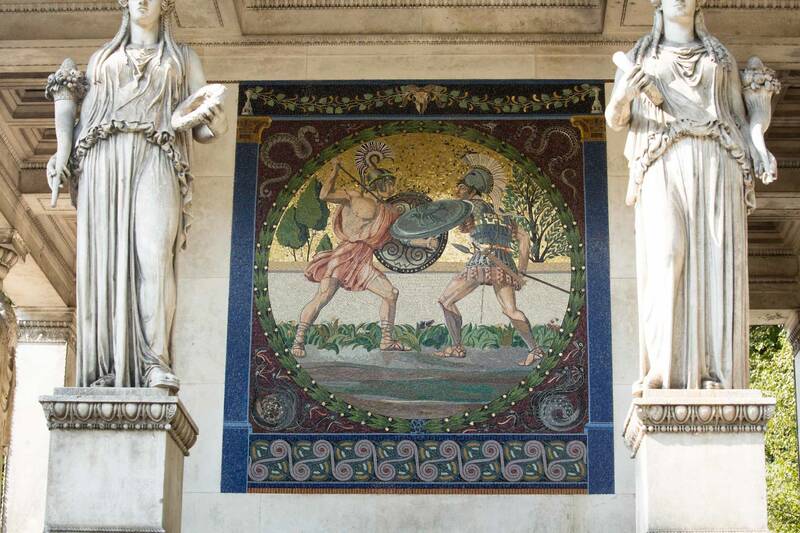 You'll feel like you're in Greece at the Königsplatz with its classicist buildings the Glyptothek, Propylaea and the Staatliche Antikensammlung collection of antiquities. In the 19th century, King Ludwig I dreamed of turning Munich into an "Isar-Athens". His residence and court architect Karl von Fischer designed the square, which at that time was still at the edge of the city, in the style of the Acropolis in Athens. From the Königplatz, we pass the Propylaea heading towards Brienner Strasse. 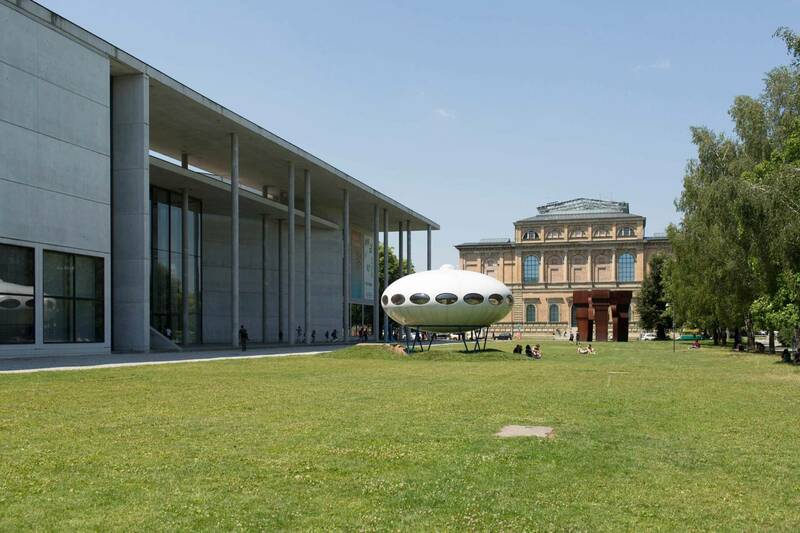 Immediately on the right is the Lenbachhaus which, with its municipal gallery, is a further part of the Kunstareal. The Munich Prince of Painters Franz von Lenbach (1836 to 1904) has his artist's residency here: "I intend to build a palace for myself that will eclipse everything the world has seen; it will link the power centres of European high art to the world of the present" – wrote Lenbach in a letter in 1885 before building his villa. Today, the museum houses the world's largest collection of Blue Rider art, with works by Wassily Kandinsky, Gabriele Münter, Franz Marc and others. We enjoy lunch at the Löwenbräukeller on the Stiglmaierplatz. In the summer, you can sit in the shady beer garden here, or in the cooler months take a seat inside in rooms steeped in history. 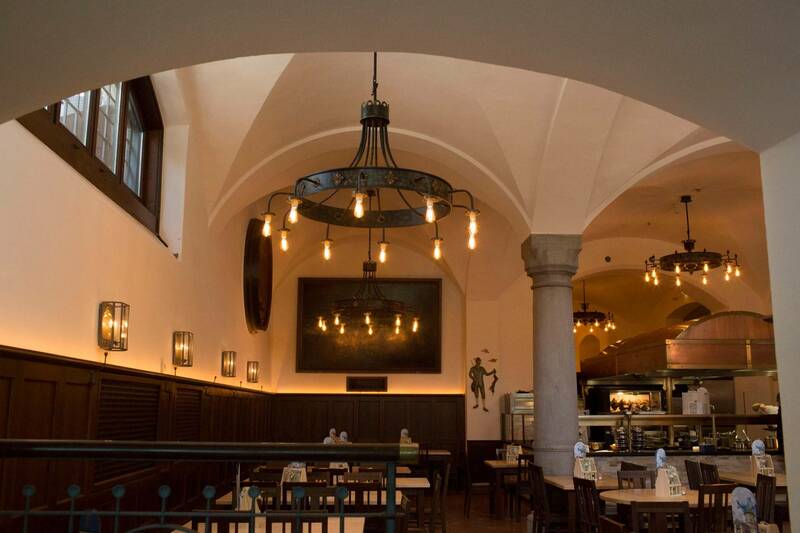 This traditional Munich inn dates back as far as 1883 but has also known some dark times: it was here that Adolf Hitler gave his Stalingrad Speech in 1942. 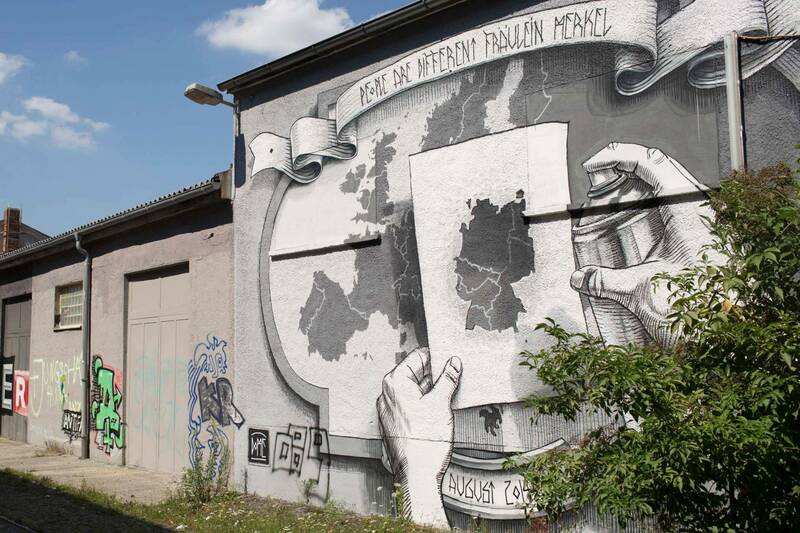 Artists and designers have their studios and workshops here, on the site of the former Luitpold barracks, between Neuhausen, Schwabing and the inner city exhibitions, workshops and concerts are also held among the area's old industrial buildings, brightly-coloured graffiti and rampantly growing gardens. To reach our next stop, the Creative Quarter, we take the tram for three stops from the Stiglmaierplatz to the Leonrodplatz. Artists and designers have their studios and workshops here, on the site of the former Luitpold barracks, between Neuhausen, Schwabing and the inner city exhibitions, workshops and concerts are also held among the area's old industrial buildings, brightly-coloured graffiti and rampantly growing gardens. We then head along the Dom-Pedro-Strasse to the start of the Nymphenburg Canal. 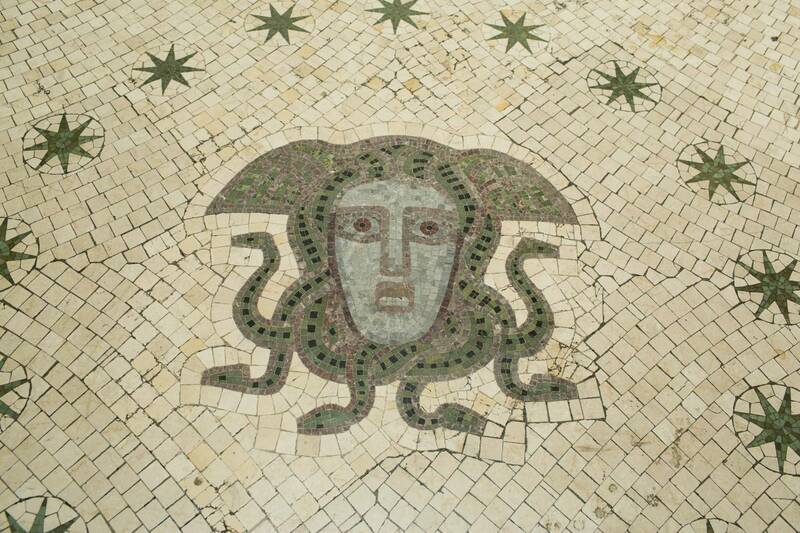 Here, we find the impressive Hubertus Fountain built in 1903 in the style of a covered temple. 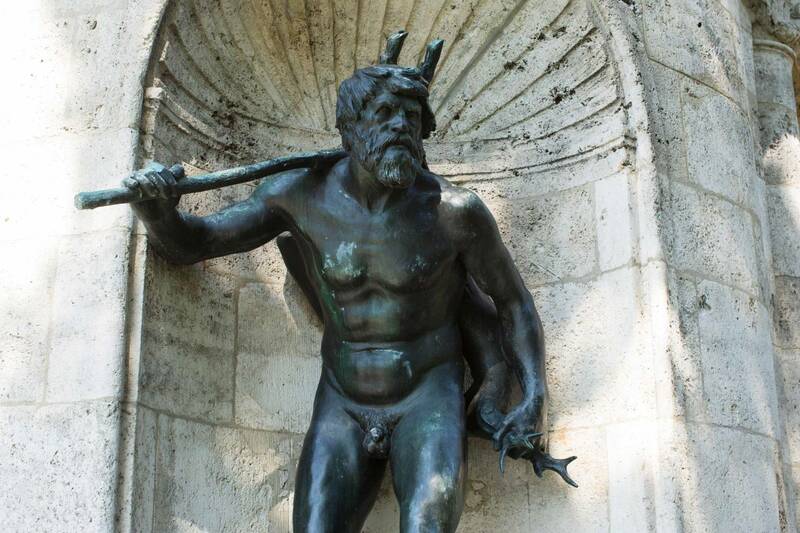 The fountain, which has the statue of a deer on the inside, used to stand in front of the National Museum on the Prinzregentenstrasse before the National Socialists relocated it to its current position. As we arrive, couples with picnics are waiting for the sun to go down behind the Nymphenburg Palace. 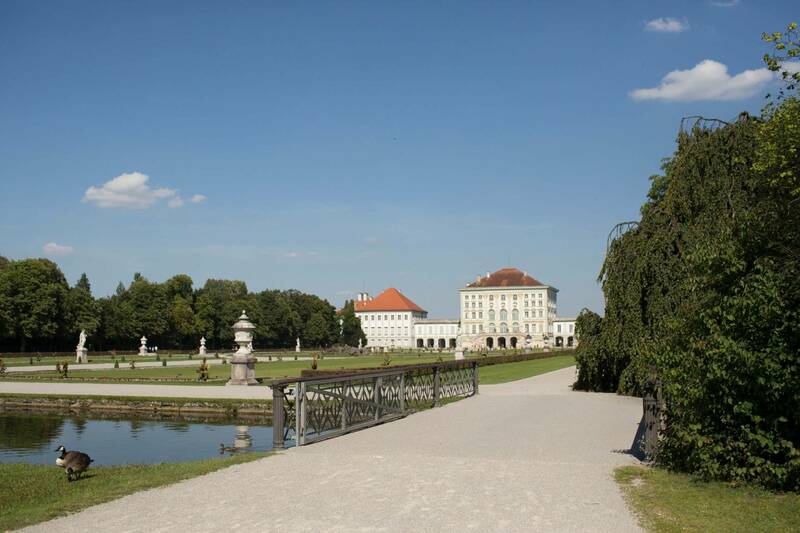 A walk along the canal – constantly keeping the palace in view – takes us towards our ultimate destination. The canal to the east of the palace, flanked by two avenues, was constructed under the Elector Karl Albrecht between 1728 and 1730. The palace is somewhat older: Elector Ferdinand Maria commissioned it as a gift for his wife Henriette Adelheid of Savoy in 1664 after she had borne him his longed-for heir Max Emanuel. For centuries, the magnificent building served the Wittelsbach family as a summer residence. The walk through the palace gardens is delightful: We stroll past the park palaces to what is known as the village. The houses, some of which are still occupied, embody the idealised idea of rural life in the court period. The walk through the palace gardens is delightful: We stroll past the park palaces to what is known as the village. The houses, some of which are still occupied, embody the idealised idea of rural life in the court period. The rulers at the time liked to imagine farmers and shepherds living in some kind of rural idyll. 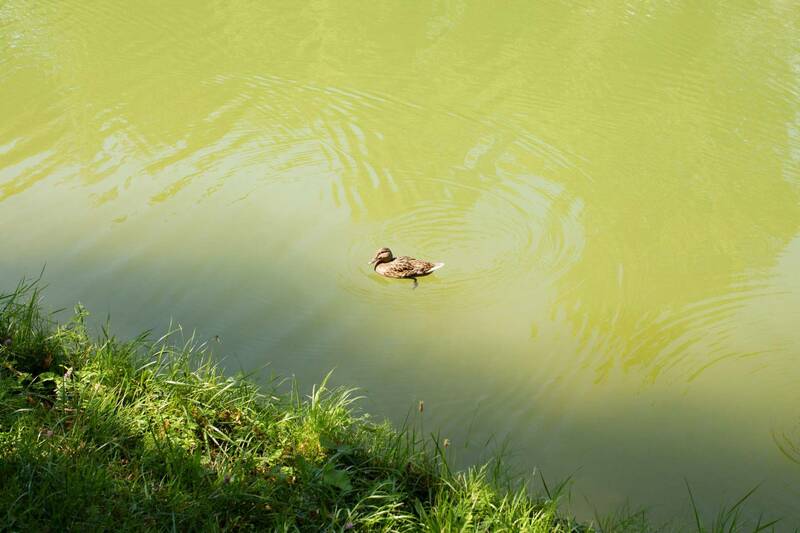 Examples can be found in a hamlet in Chantilly park and in the park at the Palace of Versailles. 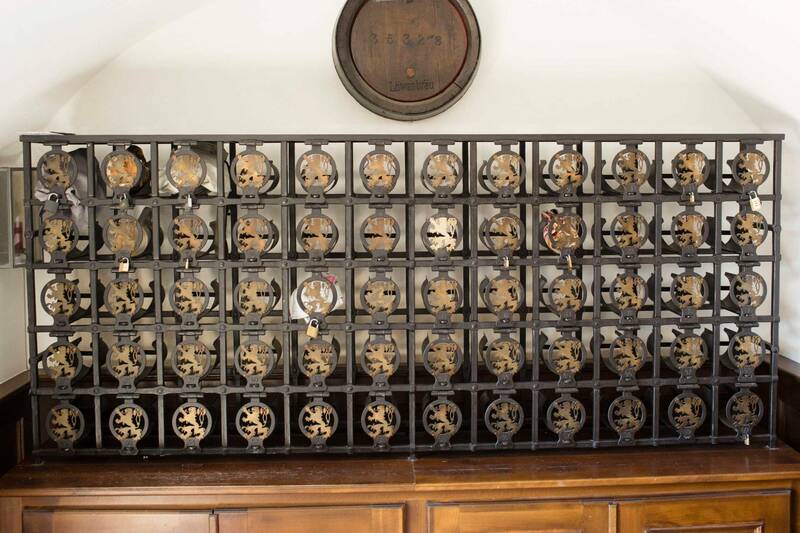 We end the day at the Schlosswirtschaft Schwaige restaurant – completely relaxed and content. If that's whetted your appetite – simply slip into some comfortable shoes, pack your picnic and off you go! Alternatively, you can take a tour with our official Munich Guides. The following guided tours cover some of the topics we touched on during our east to west walk: Munich City of Art, King Ludwig I., Nymphenburg Palace, Royal Munich and Munich – "Capital of the Movement".